The month of June is named for Juno, Goddess and protector of women and marriage. And June is host to two powerful celestial events: the Full Strawberry Moon on June 28 and the Summer Solstice that just occurred on June 21. We’re going to celebrate both of these with our Facebook Live Meditation on Thursday, June 28, and you are invited! ==>>RSVP to join our meditation circle here. The June moon was named by Algonquian tribes because it coincides with the time of wild strawberry picking. So while the moon is not actually going to look like a strawberry on June 28, it is associated with the harvest of something luscious and juicy and good. As June draws to a close, may the light of the Summer Solstice inspire your own brightness and nourish the growth of all you wish to bring to fruition this summer. 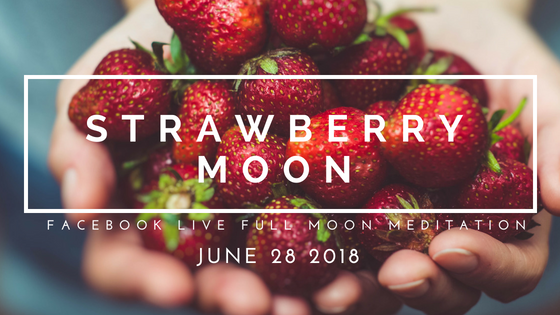 Tune in with me live on Facebook Thursday, June 28th at 12:30 pm EST / 9:30 am PST / 5:30 pm BST / 9:30pm in India to meditate with the Strawberry Moon.